BERLIN, Germany -- German voters are swinging behind their government's tougher line against Moscow after long being willing to give Russia the benefit of the doubt in its dispute with Ukraine. 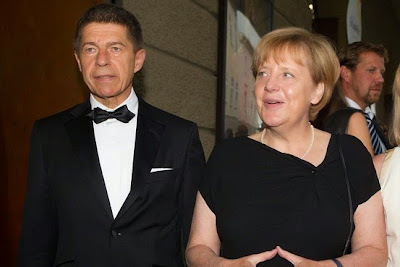 German Chancellor Angela Merkel is seen with her husband Joachim Sauer at the Salzburg Festival in Austria this week. Her popularity has reached its highest level in nearly seven years. An opinion poll published Friday shows Germans widely support the European Union's latest sanctions against Russia and an overwhelming majority view the Kremlin's actions in eastern Ukraine with an increasingly critical eye, with 82% of Germans surveyed saying Russia can't be trusted. The poll, conducted by Berlin-based Infratest Dimap for broadcaster ARD said 70% view tougher sanctions against Russia as the right thing to do. Of the 1,003 people questioned, just 15% consider Russia to be a trustworthy partner. The poll marks a sharp shift in public opinion since the downing of Malaysia Airlines Flight 17 over eastern Ukraine last month. A survey by the same pollster published on March 7 showed only 38% of Germans supporting economic sanctions against Russia, and one published on April 30 saw only 51% favoring travel bans on some Russian officials. In April, 48% said Berlin shouldn't take sides in the conflict between Ukraine and Russia and 35% that it should show more understanding for Moscow's position. The shooting down of the Malaysia Airlines plane marked a clear and sharp shift," said Richard Hilmer, head of Infratest Dimap, because it exposed what many saw as reckless and callous behavior by Russia and brought the fighting in eastern Ukraine much closer to home. The U.S. and Ukraine have accused pro-Russia separatists of shooting down the plane with weapons supplied by Moscow. Both the Kremlin and the rebels deny the allegation. In Friday's poll, 80% of German respondents said Russia was largely to blame for the escalation of the conflict in eastern Ukraine. The ARD-DeutschlandTrend survey was conducted on Monday and Tuesday, before Russia banned imports of a wide range of U.S. and European foods in response to Western sanctions, and had a margin of error of 1.4 to 3.1 percentage points. In a sign of persistent caution, only 49% of respondents said they would continue to back sanctions if the dispute were to have a negative impact on growth and jobs in Germany. "The fact that almost 60% of people think Russia and Europe can be partners again in the long term shows there is still hope that conflict can be defused through diplomacy," Mr. Hilmer said. Manfred Güllner, head of Forsa, another Berlin pollster, said "the belief that the conflict can only be solved diplomatically remains unchanged." Several German newspapers have called for a resumption of diplomatic efforts to end the crisis this week and Chancellor Angela Merkel interrupted her holiday to call Russian President Vladimir Putin on Wednesday, after 17 days of silence. Friday's ARD poll found voter satisfaction with Ms. Merkel's government at 59%—up seven percentage points from June. The chancellor's popularity of 74% is at the survey's highest since October 2007.